These spinning plates are manufactured from a heavy gauge, hard temper aluminum. The hardness minimizes bending and denting; the heavier weight maximizes spin time. The plate profile is designed for both rim and center spinning. Each plate has a smooth rolled edge and is powder coated in a durable, high gloss white finish. Our original two-piece handstick set is constructed with one end of each stick fitted with a plated brass ferrule, allowing for easy disassembly for packing or traveling. 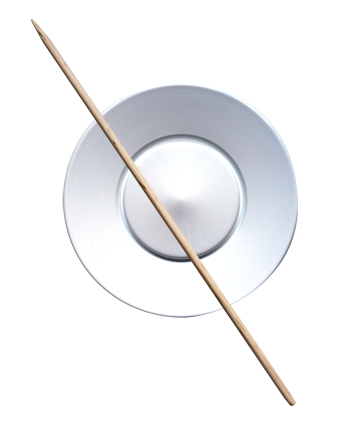 Handsticks are made from hardwood - one end is tapered/pointed for spinning; the other is rounded for hand comfort. Extensions are available with ferrules on each end - one or more can be combined with a handstick set to extend length. Each plate set includes one plate, one two-piece handstick set and one instruction sheet. #0701 Aluminum Spinning Plate with 2-Piece Handstick Set $45.50 ea. 2 skills at once, Blayk Puckett is on it with his Dubé Juggling spinning plate. Learn the correct way to hold and spin plates, a little history, and more tips from Kyle Petersen live from the Dube Juggling showroom. clubs, spinning plates to the delight of school children.